Be the first to share your favorite memory, photo or story of Brendon. This memorial page is dedicated for family, friends and future generations to celebrate the life of their loved one. Brendon Matthew Koch, a resident of Perry, Oklahoma, went home to be with his Lord and Savior Jesus Christ on June 17, 2018. A celebration of Brendon’s life was held at 2:00 pm, June 22, 2018 at the First Baptist Church of Perry with Pastor Steve Smith officiating. Brendon Matthew Koch was born on March 18, 1999, in Stillwater, Oklahoma, to Geoff and Keri Koch and was a lifelong resident of Perry. He was a smart, witty, and playful guy that always loved a good prank or one-liner. His smile and sense of humor would lift the spirit of a room and his love for life and Jesus was evident to all who knew him. Brendon was homeschooled throughout his elementary, junior high, and high school education. He was a member of several homeschool co-op organizations during the years including PACE, 4-Him 4-H, and SCHEF and recently received his high school diploma. He attended Meridian Technology Center for three years, serving as treasurer of the local SkillsUSA organization for one year. He graduated in May of 2018 from the Pre-Engineering program with honors as a member of the National Technical Honor Society. Brendon was accepted into the Aerospace Engineering program at Wichita State University and looked forward to starting his degree program in the fall. Brendon attended the First Church of the Nazarene in Perry. In his early childhood years, he was an active participant in Sunday School and the Caravans program including completing the Phineas F. Bresee award. As a teenager, he was an active helper with VBS, Good Friday dramas, Hosanna Chapel, and several skits in the church. Brendon was involved in many things with the youth including Winter Jams, Lock-ins, Soup Kitchen, and the Nazarene Youth Conference. Brendon enjoyed playing all kinds of sports including little league baseball, volleyball, and cards, but his true love was basketball. He started with YMCA basketball and played through sixth grade in Perry before moving on to play with the OKC Storm in Junior High. 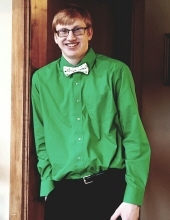 For the last two years, he played with the Ponca City Saints Homeschool Basketball organization where he developed some of the greatest friendships and memories in his life including getting his first dunks. On the court, Brendon grew into a leader on his team receiving honors for first team all KCAA league and tournament teams and helping his teams to a 2nd place finish in both the KCAA state tournament and NDIICHA national tournament. Brendon worked at 611 Bakehouse for four years, first as a volunteer and later as part of the staff. He originally served as part of the cleanup crew, moving into the food preparation staff, and later learning how to barista where he enjoyed getting to prepare and serve drinks to many members of the community. He also assisted with pizza nights and other events that were part of the 611 Ministry. Faith, family, and friends have always been important to Brendon. He lived his life for the Lord and honored him through his words and actions. He was loved by all of his family, especially by his younger cousins who Brendon always took time to just play and be with. He found his strongest bond through his youth Bible study group comprised of homeschool students and basketball teammates that became just like family to him. He attended Falls Creek for four years where he deepened his relationship with the Lord and the rest of the group. He had just finished Bible study on Sunday night and was heading into town to play basketball with the group when he went home to Heaven. Brendon was preceded in death by his paternal grandfather, Ralph Adkins, uncle, Gary Adkins, and aunt, Jana Allen. He is survived by his parents, Geoff and Keri Koch, sister Cierra, and brother Lincoln all of Perry; maternal grandmother, Linda Adkins of Perry; paternal grandparents, Gary and Gloria Koch of Orlando, OK; one aunt, Genelle Crochet of Perry; one uncle, Greg Koch and wife, Jaye of Seven Springs, NC; numerous cousins, and a host of extended family and friends. To send flowers or a remembrance gift to the family of Brendon Matthew Koch, please visit our Tribute Store. "Email Address" would like to share the life celebration of Brendon Matthew Koch. Click on the "link" to go to share a favorite memory or leave a condolence message for the family.